Instance leveling is the latest trend for World of Warcarft players wanting to take their characters from level 1 to 85 in the shortest amount of time. Many players are now watching each and every level just fly by, often leveling at least once or twice in just one instance. Never before has it been so easy to find a group, and WoW players are eating up the experience like it’s going out of style. Instance leveling came about with patch 3.3 in the Wrath of the Lich King expansion. Before the dungeon finder existed, players had to search for groups themselves, which can be very difficult if you don’t have a lot of friends with toons that are about the same level as yours. The old method of finding groups was made even more difficult by the fact that it was limited to your own server. Thankfully, the dungeon finder changed all that. Using the dungeon finder to find groups for instance leveling makes it very easy to experience the group portions of the game. You can find groups even during your server’s off times because the finder brings together WoW players from all of the servers in your server group. To use the dungeon finder, just click on the “Looking for Group” button on the bottom of your interface. It looks a lot like a large green eye. You’ll have to select a role and then go. If you’re a DPS class, you may find that the wait is quite long. This is why it’s best to complete some solo quests while you’re waiting for your instance to come up. Just make sure you’re not away from your keyboard when the instance pops up because it will kick you out if you don’t click “accept” within 30 seconds of the instance becoming available. There’s nothing more annoying than waiting for 20 minutes for an instance and then being kicked out of the queue because you were AFK for a moment. Whether you’re planning to complete solo quests or not, it’s not a bad idea to have an instance leveling guide to help you. 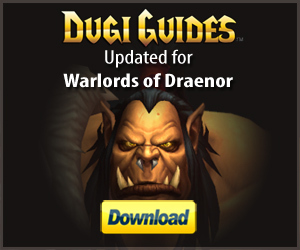 Instance leveling guides like Dugi’s Dungeon Leveling Guide will tell you which solo quests to do in order for your toon to become eligible for the quests that can be done inside of the instances. The time you spend waiting for your instance to become available is the perfect time to do these prerequisite solo quests. Of course tanks won’t have much of a wait time when it comes to instance leveling, so they may want to carve out some time to complete these prerequisite quests separately. On the other hand, tanks can get into instances so quickly sometimes that they may not want to do the prerequisite quests. However, it’s important to remember that there are plenty of bonuses for completing instance quests, so it may be worth the extra time to make sure all the prerequisite quests are completed.